SoVoSo is a highly imaginative a cappella ensemble that sings a unique, rhythmic mix of jazz, gospel, world and R&B music, all rendered in their trademark improvisational style. The SoVoSo repertoire consists of original compositions and other songs that present a global perspective, from Afro-Latin idioms to traditional funk and jazz arrangements. Two SoVoSo members (Joey Blake, past member, and current member David Worm) are current members of Bobby McFerrin's a cappella group, Voicestra, performing with him from 1993 to present. Currently you will see David Worm, Sunshine Becker, Bryan Dyer and Zoe Ellis in this vocal band line-up, along with other great singers such as Nicolas Bearde, Ashling Cole and Vernon Bush. The SoVoSo family of singers continues to expand as this one of a kind musical project grows and flourishes. Serengeti rhythms, New Orleans style funk, Jamaican reggae dubs...SoVoSo's brand new release, entitled Bridges, spans the musical globe, transporting the listener across traditional cultures to a contemporary, one-village world of human harmony. You'll be dancing to a tribal beat one minute and closing your eyes to take in a soulful ballad the next. With titles like "Big Family," "Precious," "For I Am TheMoon," "New Groove," "Charity," "Build A Bridge," and "Say," (a remix),this all-original, genre-blending collection includes gospel-flavored R&B, rock and soul ballads, jazz riffs and spoken word poetry over African rhythms. SoVoSo forges thoughtful lyrical territory, from love songs to anthems calling us toward our universal humanity, all rendered in superlative musicianship through the fundamentally human instrument -the voice. Bridges clearly places SoVoSo on the map at the cutting edge of world-soul-beat music. Don't miss the latest from one of the most innovative a cappella groups on the planet. 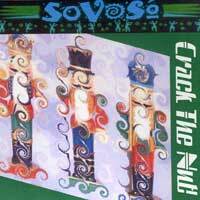 1997 Harmony Sweeps Winners, and one of our favorite soulful Aftro-Latin World/Jazz groups, Oakland-based SoVoSo celebrates the December, 2004 addition of a fifth member, veteran Bay Area vocalist Zoe Ellis, with their new CD, "Crack the Nut!" The innovative mixed-voice group, which cut their a cappella teeth performing with Bobby McFerrin, follows the Swingles off in an exciting new direction here, performing some of the best works of Tchaikovsky's beloved Nutcracker Suite. But where Ward Swingle's focus was generally replacing instruments with voices on classical music, SoVoSo employs the considerable arranging talents of David Worm, Bryan Dyer, Sunshine Becker and Joey Blake, and some surprising vocal percussion and faux electric guitar riffs to transform these songs into something quite their own. 9 songs: the moody "Reed Pipes" (which segues into an African chant), "Skaters and Jugglers" (which becomes a surreal reggae piece), "Spanish Dance" and "Mother Gigogne" (bright, folkish waltzes), "Russian Dance" (a very Swinglish cover), "Arabian Dance" (which becomes a rock anthem with screaming "guitars"), "Waltz of the Flowers" (a jazzy, scattish romp), "Sugar Plum Fairy" (with a Led Zeppelin flavor and a "Hernando's Hideaway" sample), finishing with the lovely ethereal, breezy "Finale Waltz." In our opinion, "Crack the Nut!" is on track to win SoVoSo another CARA award, and to create many more fans for this exceptionally talented group! Anyone who lights up their days of the Holiday Season with vocal music (and especially those who saw the group at the West Coast Summit and Sweeps Finals) must have SoVoSo's latest release, "Seasonings." This world-renowned ensemble has mixed together a wonderful recipe of songs that span their diverse cultural and rhythmic background, from a jazzy swing version of "Drummer Boy," a worldly chant of "O Come Emmanuel," and a classic and soaring "O Holy Night" with original songs that include Joey Blake's infectious "Holiday Season" and Sunshine Becker's portrait of the holiday Southwest style in "Christmas in Questa." The magic and light of the holidays are truly captured on this special and much awaited CD. The Bay Area's favorite soulful World/Jazz mixed quintet looks back on a career that began for some members with Bobby McFerrin in his Voicestra. A win at the '97 Harmony Sweeps, many memorable live performances and 5 excellent recordings brings this amazing group to their first independent release, a remarkable "best of" collection of 13 songs. They're all favorites, but Curtis Mayfield's "People Get Ready," the group originals "One Love," "With You," "Hurt So Bad," "Be Of Love," "For The Forest," "Life and Love" and the complex, surprising "Dirt" are especially sweet. Throughout we are continually reminded what a gift SoVoSo has been to us, Then and Now! What happens when you get six lead singers to perform in one group? You get SoVoSo. Each of the individual musical personalities take their turns expressing themselves with the total support of the other singers. Unheard of! Amazing! And just plain wow! "Be Of Love" is David Worm's opening tune. I would pick Joey Blake's "Thank You For The Dream" as his representative composition but notice has to be taken of the fact that he wrote and arranged "Life and Love" which Sunshine Garcia has made her own. Melanie Rath's pure soprano swoops, dives and scats through Mongo Santamaria's "Afro Blue." Rhiannon presents her autobiographical, "In My Prime." And finally, Nicholas Bearde leaves us with a soulful, "Clear Winter Skies." In the vernacular, it don't get any better than this! 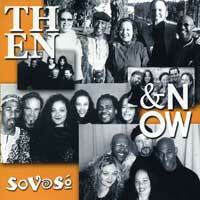 1997 Harmony Sweepstakes Winners, SoVoSo alsowon the CARA that same year in the category Studio Album Of The Year. The majority of the six members had been singing together for ten years or so, since being members in Bobby McFerrin's Voicestra. In fact "Dirt" the six movement, twenty plus minute marvel of improvisation was written by McFerrin and SoVoSo as a dance score for the Oberlin Dance Co. of San Francisco. This reviewer particularly loves Melanie Rath's "Show Them Dance"; David Worm's "Say", Joey Blake's "Tu Para Mi" and Rhiannon's "Say A Prayer." Oh heck, all of them!